I’ve noticed a disturbing trend over the past few years, which started with the introduction of smartphones and has continued at an accelerated rate with all devices, and that is the complete removal of ownership over your devices and personal computers. Corporations now have more power over your device than at any point in history. Companies can control what software runs on your machine, update your machine without your consent, run hidden background services that can’t be removed, remotely delete files, track your devices location, and even limit what operating system your device can run. Many PC’s now run protected EFI bios software that prevents unsigned operating systems from loading, and although the major Linux distros now have signed boot loaders and the boot protection can be disabled, this could easily be used in the future to lock out any operating system from running on the hardware. This is already being done with locked boot-loaders on Android and all of this is being done under the guise of securing things, however if proper sand-boxing environments were developed and implemented then you wouldn’t have to sacrifice software freedom for security. Companies are now allegedly slowing down old devices with updates. Apple was recently targeted with a class-action lawsuit for slowing down and in many cases crippling old devices with software updates, when the old software ran perfectly fine the same device. This could be attributed to bad programming, however if a company’s primary revenue stream depends on you constantly buying the latest phone, I wouldn’t put it past them to cripple old devices to influence you into buying the latest version. Even if you refuse to update, newer software will refuse to run on the older version of the operating system even though no API incompatibilities exist. Microsoft has consistently attempted to force you to upgrade Windows by not making the latest versions of Internet Explorer, DirectX and Windows Media Player available to older versions of Windows, potentially opening the door for security flaws in the older software, and causing you to lose out on the latest features. Companies run countless services designed to send every single activity you perform on your device back to the software companies. Almost all of it is enabled by default, and the average Joe has no idea how to disable it once they’ve inadvertently enabled it. Some of it can’t even be disabled, and is active even when the device is in a lower-power state. It’s claimed to all be for convenience, customer improvement, and advertising and that there is no malicious intent, however as history as shown, absolute power corrupts absolutely. It’s only a matter of time before this information is sold to someone who will use that information for something more nefarious, or it is hacked by a foreign government or rogue hackers. If you want to see the damage information can have, you only need to look at the Ashley Madison hack; millions of people exposed for the world to see, lives being destroyed, and countless others being blackmailed. Some say they deserved it, however, it shows what can happen if private information is leaked. There is a relentless push to store all of your documents on the cloud, rather than stored locally on your own machine. Many smart phones, tablets, chromebooks and laptops now come with the bare minimum of storage required to run the OS and applications with no external media options, so that you are forced to store your media remotely on to the cloud or suffer the consequences. I’d like to cite the celebrity photo-hacking scandal of 2014 as a real example of the dangers of the cloud. It was believed to be caused by a lax set of security standards on iCloud. However, even if the security was top grade, anyone who can guess some security answers can gain access to your personal files. You also have the risk of these companies being hacked and back doors being found. Many of the hacked celebrities had no idea their personal images had even been synced to the cloud, and some of them had reported that the images had been deleted off their phones but somehow remained on the cloud. This brings up further concerns because it means that anything synced to the cloud could potentially stay on the cloud forever, and is not able to be deleted by the user. How would you feel if personal photos of your loved one ended up all over the internet? You are now coerced and sometimes even forced to login with an account just to use the operating system, this is true for Android (Google Account), iOS (Apple ID), Mac OS X (Apple ID), and Windows 8.x and above (Microsoft Account). Even if you decline to use an account, many of the built in applications will refuse to operate or be severely limited. Again, this is done for advertising and convenience, however it further solidifies the theory that they want to catalog everything they collect on you under a single identity. Software is now moving towards being either subscription based, adware, or spyware based. Much like data storage it’s also being shifted towards web services; with your PC, phone or tablet being nothing more than a terminal used to access it. You never truly own any of your devices, and the very notion is becoming obsolete. Software can now be discontinued and erased from existence, and nobody will have the means to use it ever again. Companies can also decide to start charging a high premium to use their cloud based software once enough users become dependent on it. 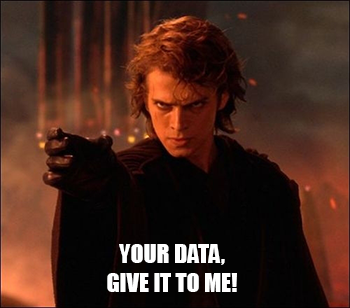 Now you and your data are the product, and the software is nothing more than the means to extract value out of you. This is why so many companies are pushing to give you free software and services. They aren’t really free; you’re paying with your usage. Aside from some massive public shift in thinking, I see these dark trends continuing. Devices will continue to transition to be nothing more than ad-filled data-mining terminals, alternative desktop and mobile operating systems will continue to die out because of the lack of interest and lack of capable open devices capable of running them, and companies will continue to get more and more brazen with their data-mining and closed-platform efforts. I hope users wake up before it’s entirely too late to turn back, but we are quickly reaching that precipice. Anyway, contact me if you have a differing opinion, or you have anything else to add, I’d love to hear what other people think.